If you read a children’s book to your 7th graders…. Of course, that sparked their curiosity. How could it not? I was speaking their language. After everyone was seated, and we took care of our other learning goals, they gathered around while I read this “classic” out loud. While I read it, some giggled, some read along, and some rolled their eyes. But all of them had to help me find the independent and dependent clauses in the book. Oh, and they identified sentence types too. By the end of the book, they were seeing the pattern of the complex sentence. 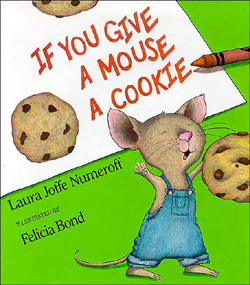 And luckily, Laura Joffe Numeroff included some simple and compound sentences just to keep it interesting. We had a nice discussion about how the author used a variety of sentence types to create a story that children would enjoy. The learning didn’t stop there. I had more planned for them! If you give a Soc girl….. I kept the directions simple: Finish the dependent clause and add an independent clause to make a complex sentence. After they conferenced with me, they were able to glue them on the poster below. If you give a Soc a car, he will mess with the Greasers. If you give a Soc girl a hard time, she will most likely throw a Coke in your face. If you give a Greaser a dollar bill, he will be your best friend. If you come home late to Darry’s, you should not mouth off. If you give a Greaser a blade, he will use it to defend himself. If you attack Ponyboy, Johnny will kill you. They had such a great time with this lesson, and I felt like I was able to hit a lot of concepts in one period! Independent and dependent clauses and sentence types are a Common Core standard for 7th grade. We worked on editing our sentences for capitalization, punctuation, and spelling which is a definite need of my students. At the end of class, students had to mark and label clauses in four different sentences I had taken (and possibly slightly adapted) from the novel. If I had worries like that, I’d consider myself lucky. They were getting over it though, as we walked to Two-Bit’s house to pick up the car. When I was ten I thought Mickey Mouse and Soda looked alike. When you’re thirteen in our neighborhood, you know the score. My students asked if they could bring in other children’s books from home, so we could find complex sentences. Who am I to say no? They decided that would be their homework this weekend. Honestly, when I put the book in my book bag earlier in the week, I felt like it would be too immature and they would hate the activity. I almost trashed the idea at the last minute. I’m so glad I didn’t. Maybe give it a try in your classroom and see how it goes. You never know! If you give a 7th grader an idea, they just might run with it! Have you used children’s books to teach a middle school concept? How was it received by your middle schoolers? I’d love to hear some ideas, so share in the comments!